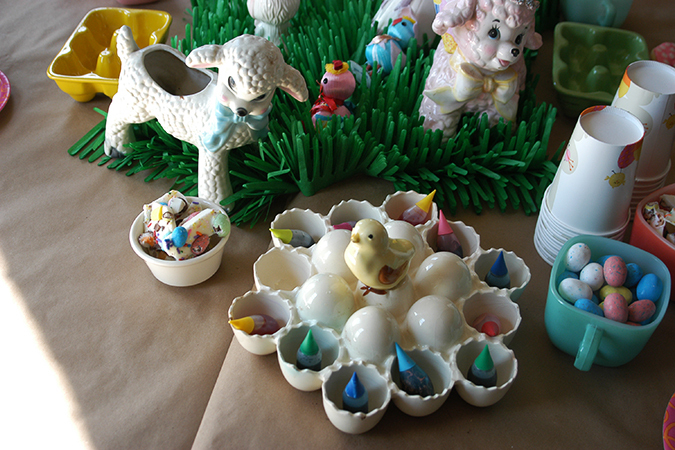 I felt like Easter really snuck up on me this year. 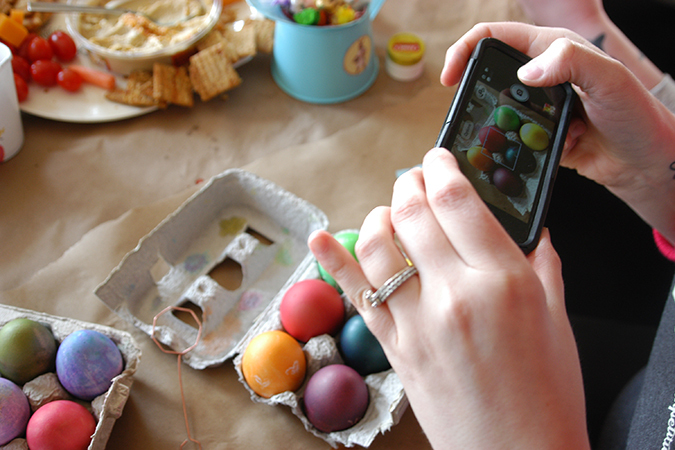 I had loads of grand plans, but in the end whenever Easter is in March-most of my plans are not going to happen. There were Easter baskets and we even managed to make clues in hidden eggs leading to B’s hidden basket (per his request) Of course we did this at 11:30pm the night before Easter, but we didn’t forget and he seemed to really love running all over the house finding clues. 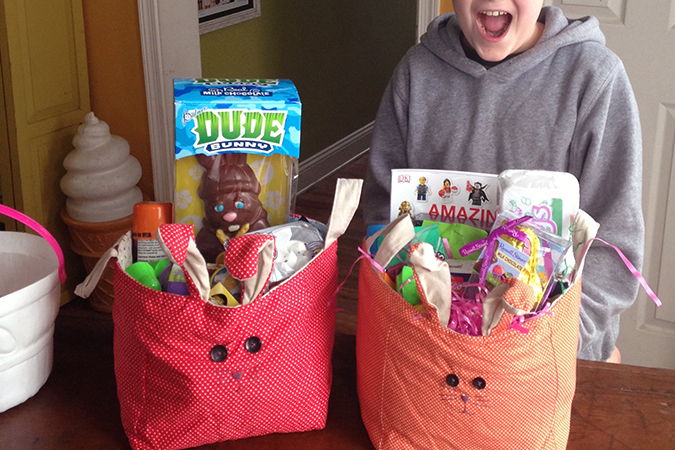 Just look at the face he made when he posed with his basket! 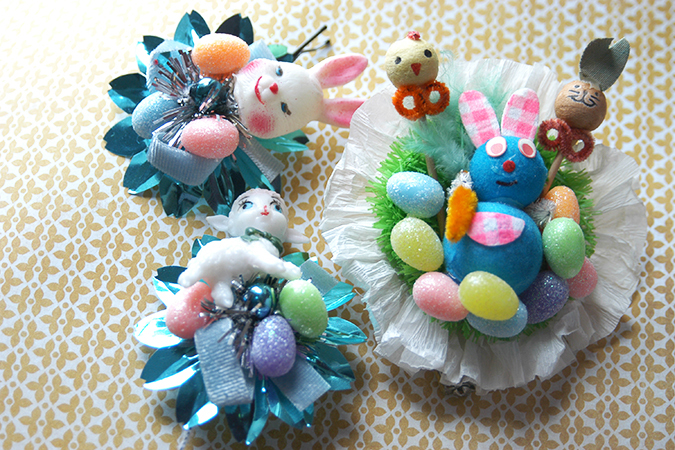 I felt like I didn’t look very festive on Easter (I was wearing black and pink) so I made some silly hair barrettes and a brooch to wear while everyone else was finishing with their showers/getting dressed for the day. 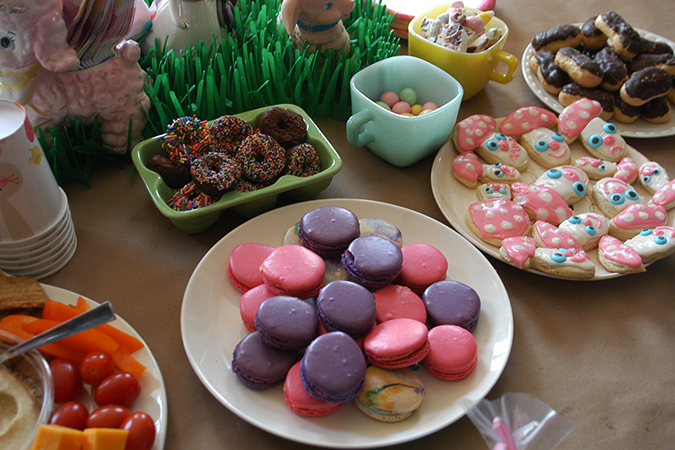 We headed to Tom’s parents house in the afternoon for an Easter lunch and I wanted to bring french macarons. 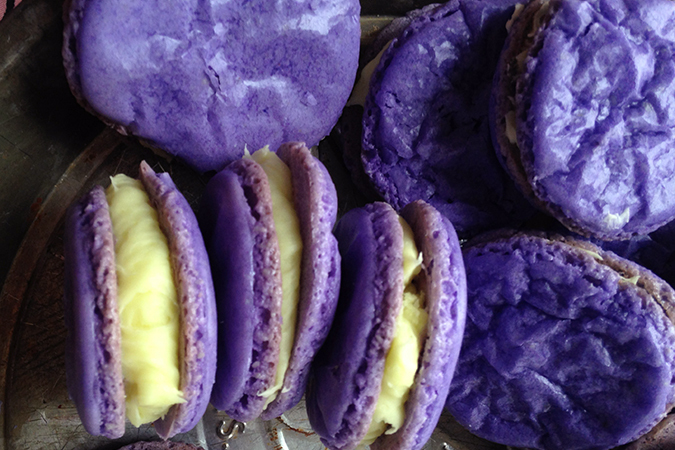 I had the idea that I would make them the day before (you might remember that Jessee gave us all a macaron lesson at her house) but its not as easy as you might think and after 6 failed attempts I decided the last purple batch was good enough. 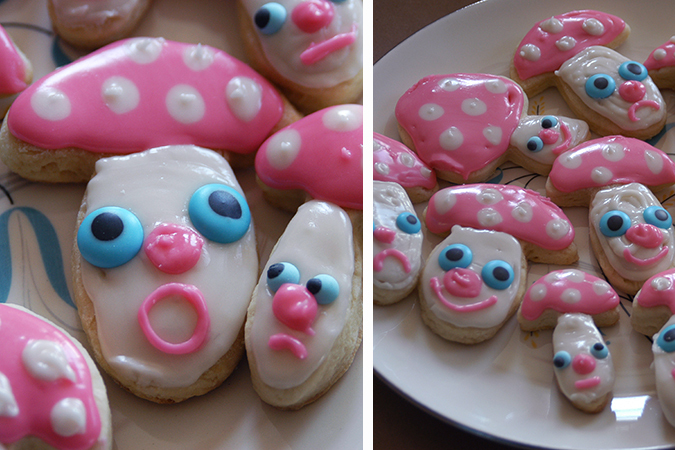 Baking macarons are definitely a talent!! 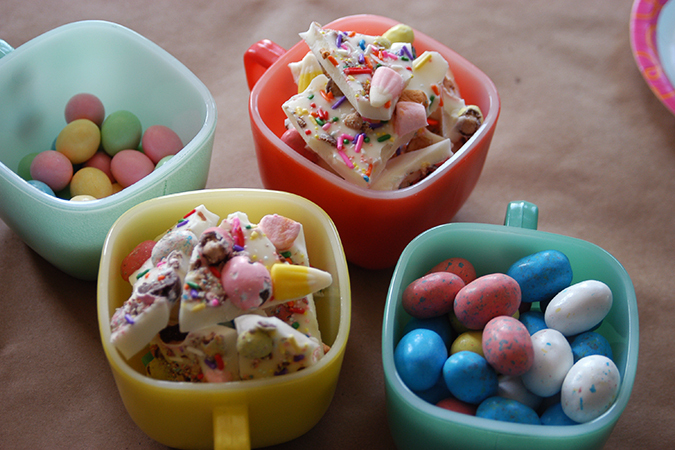 I’ll have lots of posts for you this week, as I have a bunch of exciting things to share…and that is surprisingly not an April Fool’s joke ;) Oh and a note about the baskets—I made those back in 2009 with the info found here. They work great for re-using year after year, and since they are fabric they fold up and take up less room then saving a traditional basket. 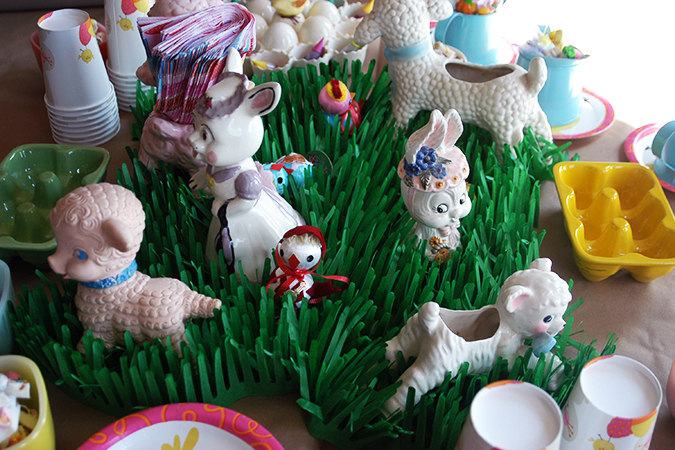 The easter decorations are starting to come out! 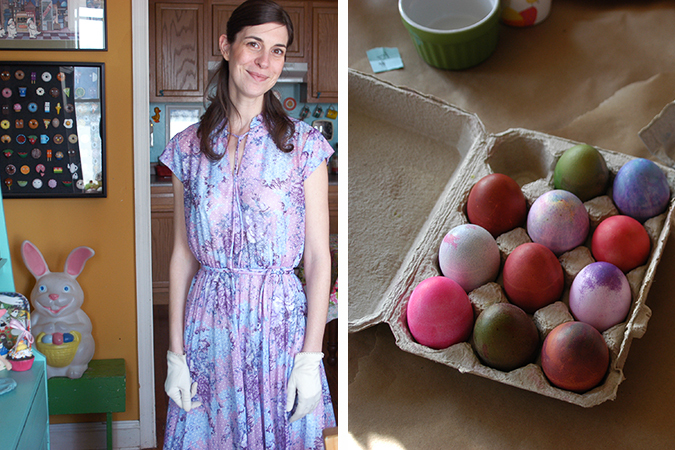 Yesterday was my March Crafternoon, and since Easter is approaching I went the easy route, and we dyed eggs instead of making anything. 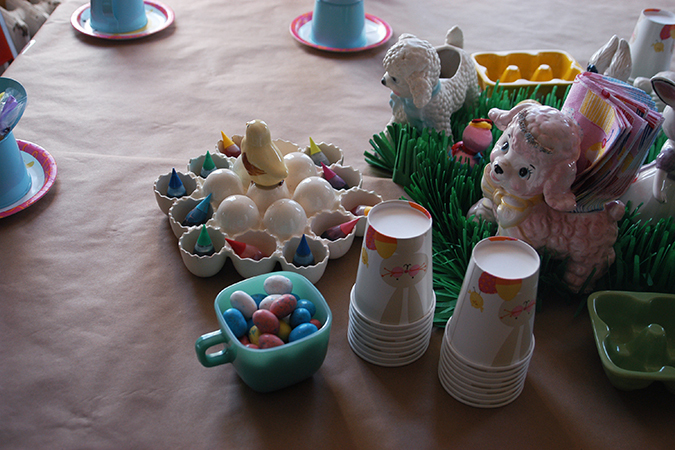 I covered the tables in brown craft paper, so any drips or spills wouldn’t matter. 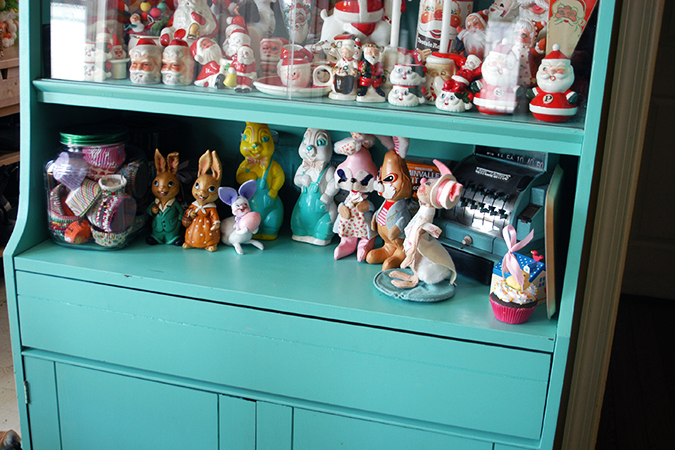 Easter is one of my most favorite holidays because I love Spring, the colors, and the really vintage Easter decorations you can some times find. 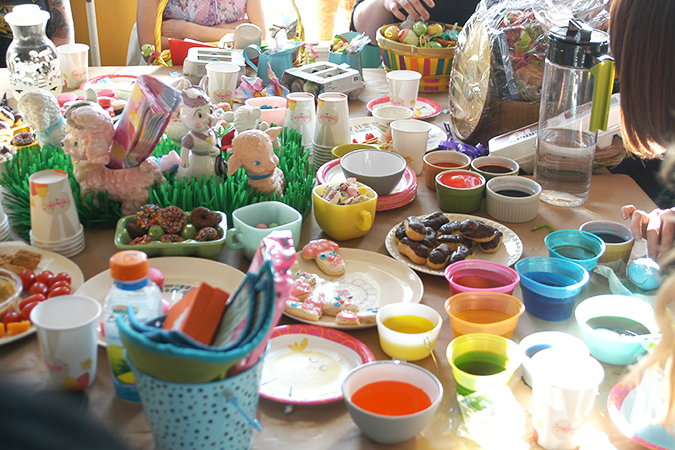 We always do a white elephant swap, but this month I thought it would be a lot of fun to have every one make an Easter basket for the swap instead. 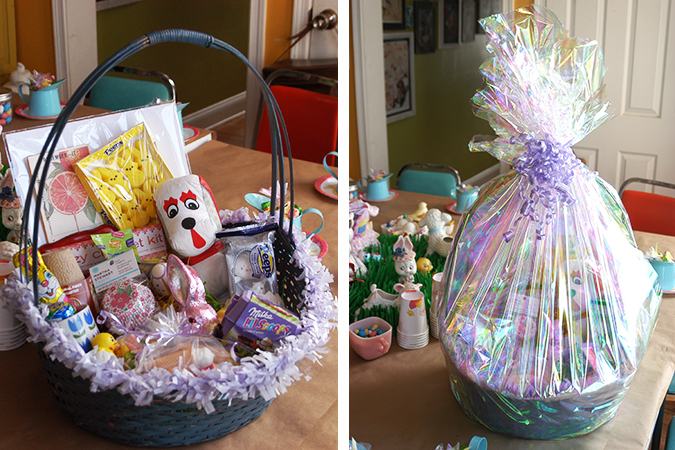 I kind of went overboard filling up a basket I found at a thrift shop, but it was so much fun! 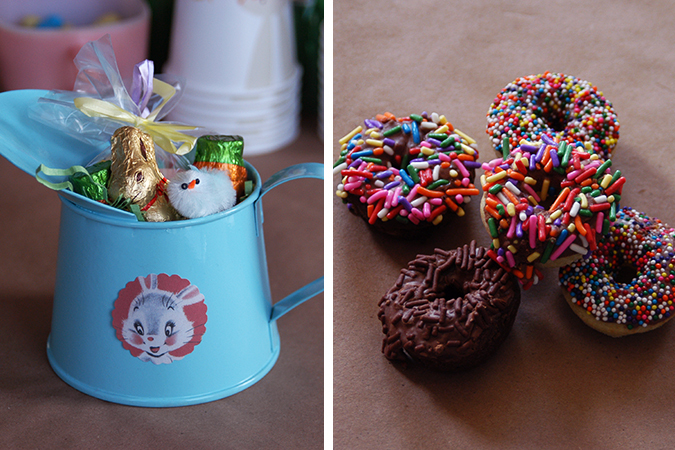 All the baskets looked so cute on the table together. 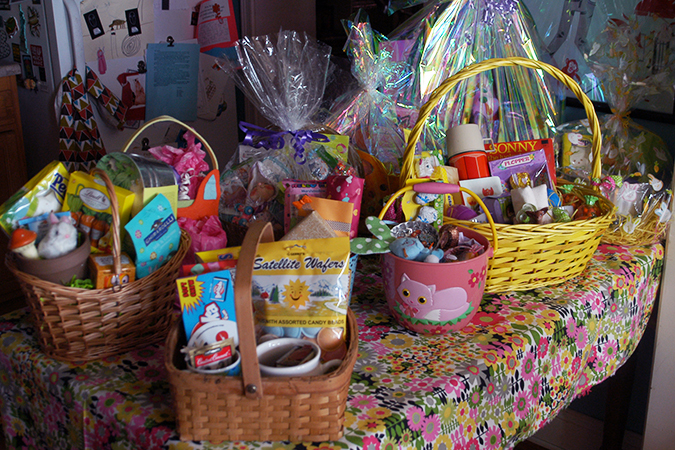 This photo actually wasn’t even all the baskets, a few arrived a little later. 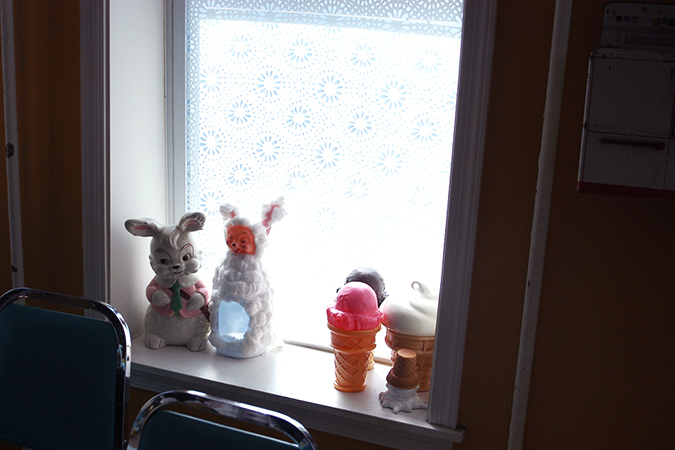 Katie wore a really cute Easter dress & dainty vintage gloves, so cute. Jessee brought a bunch of beautiful macarons, including some marbleized ones that I wish I got a better photos of. I always have so much fun with these ladies, and it was a great way to kick off Spring (slightly early) in my mind. We had really lovely 60 degree weather yesterday and it’s supposed to get just as warm today. This week I’ve got lots going on again. 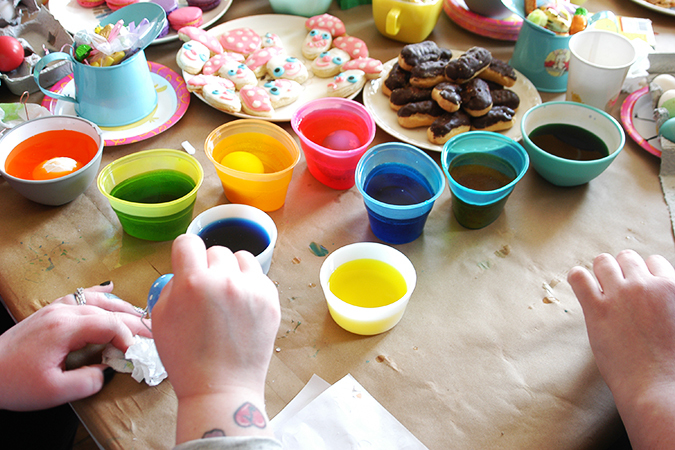 My guy’s birthday is this week, and then his party is on Saturday, so lots to do. Of course I also got it in my head that I might like to switch around two of the rooms in our house, so we shall see what happens with that.